Luton Town have made former MK Dons winger Danny Green their ninth signing of the summer. 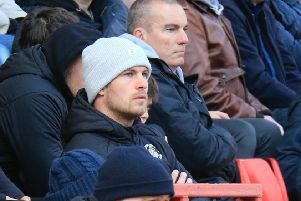 The 26-year-old was released from the Dons on Friday evening and has quickly penned a two year deal at Kenilworth Road. Green was unearthed by Hatters boss John Still when in charge of Dagenham & Redbridge back in 2009, scoring in the League Two play-off final as Daggers beat Rotherham 3-2. He netted 27 goals in 97 games in total for the Victoria Road club, earning a move to Charlton Athletic, where he helped the Addicks win promotion to the Championship. The winger then scored twice in 19 matches for Charlton, before a move to MK Dons, as he played 18 times last season, scoring twice. Green joins Stephen O’Donnell, Cameron McGeehan, Scott Cuthbert, Magnus Okuonghae, Paddy McCourt, Dan Potts, Jack Marriott and Josh McQuoid in signing for Town this season.